Outdoor concerts and summer go hand-in-hand, and even very young children will enjoy attending a musical extravaganza in the fresh air. It doesn't really matter what music will be playing, all that matters is that you and your kids have a great time – without them making life hell for other concert-goers! Free concerts at parks are often your best bet, where your children can sing, dance and clap along to the music without worrying about bothering the other people. If you attend something more formal, make sure they are well-versed in basic concert etiquette. Remember, while your children may enjoy a children's concert with some special kid's entertainment added, they will no doubt also enjoy any music which you find enjoyable. You don't have to choose a performance that is specially suited to younger tastes. In fact, attending a classical or jazz concert is a great way to introduce them to certain types of music they may not have heard much of before. 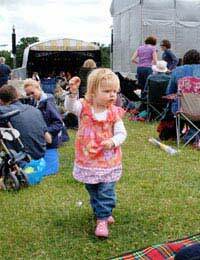 Be wary, however, of taking children to a concert where their behaviour is expected to be perfect. If the audience is very small or the venue very tight, it will be obvious when your little darlings begin to misbehave. And getting in trouble or being made to leave could turn them off future musical events for a very long time. If you plan on attending an afternoon concert, why not make a whole day out of it? Bring along a picnic, picnic blanket and some fun lawn toys such as Frisbees and footballs. After spending a few hours running around, eating and generally burning up excess energy, most kids will be happy to sit still for a while and listen to some sounds. Evening concerts can also be great fun, with the excitement of being allowed to stay up past their bedtime part of the thrill (if not all of the thrill). Many outdoor concerts welcome families and encourage kids of all ages to come along. Just remember to dress warmly and take along a torch if your child is afraid of the dark. Take plenty of blankets if you are attending an evening concert. When the sun sets and your children aren't moving, they can feel the cold faster than you can. Help make them as snuggly as possible. Have lots of snacks on hand. Nothing can keep a bored child's interest more than a packet of crisps or some sweets. And a Thermos of hot chocolate/lemonade wouldn't go amiss either. Don't be scared to leave. If the concert seems to be stretching on endlessly, it's better to do a runner than have your children bother the other concert-goers. Bring suncream, insect repellent and folding chairs. Nothing makes a child say “I want to go home” quicker than a hard ground coupled with lots of mosquito bites. Don't buy assigned seating tickets unless your kids have long attention spans. If you sit far away from the performers, your kids can run around and play while you enjoy the tunes. Don't sit too close if you choose to attend a rock concert or something similar. Little ears can be affected by loud music more than bigger ones. Attending an outdoor concert with children is a fabulous idea, and ones with fireworks at the end promise an unforgettable time. Take a picnic along and make a day of it – or a long evening. Staying up late occasionally is incredibly exciting for young children, and with a little planning you can make the concert a day – or night - they'll always remember.